The Tobacco Control Program helps educate youth about the dangerous consequences of tobacco use and provides access to smoking cessation services such as the Quit Line. Though Wisconsin collects more than $770 million a year in tobacco taxes, less than 1% of that money is reinvested in tobacco education and prevention programs or services that help people quit smoking. WI Wins - An initiative to decrease youth access to tobacco products. School Initiatives - Education, prevention, and surveying of youth tobacco use. FACT - Youth peer education on the dangers of tobacco use. Not On Tobacco - Helps youth quit tobacco use. First Breath - Helps pregnant women quit smoking. The 2013-2015 budget did not change the $5,315,000 annual funding base for the program, despite the fact that the 2011-2013 budget cut the program by 20 percent. The proposed budget provides stable funding of $5,315,000 for the Tobacco Control Program . In addition to state funding, the federal government currently provides an additional $2.3 million of funding. This combined $7.6 million in funding represents only 13% of the Center for Disease Control’s (CDC) recommended state best practices amount of $57.5 million. Wisconsin lags behind most states in Quit Line spending at $1.28 per smoker compared to the national average of $3.65 per smoker. The proposed budget also removed an existing law which permits the DHS to award grants to the Board of Regents. These grants are used to advance the work of the Tobacco Research and Intervention Center at UW-Madison in developing new educational programs to discourage tobacco use, determining the most effective strategies for preventing tobacco use, and expanding smoking cessation programs throughout the state. The Legislature approved the Governor's proposed tobacco control budge in its entirety. According to the American Cancer Society, smoking prevalence for women in Wisconsin was 17.5%, down from 21.9% in 2001. The smoking prevalence for high school girls was 14% in 2011. 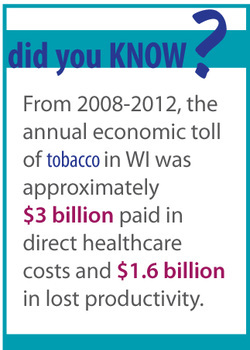 In order to successfully reduce smoking rates, the American Cancer Society recommends that states take a comprehensive policy approach to the issue by focusing on the following three policy goals: (1) raise the price of tobacco products with tobacco taxes; (2) implement smoke-free policies, which Wisconsin has already done by banning smoking in the workplace; and, (3) adequately fund evidence-based tobacco prevention and cessation programs.